Long term moving averages can confirm the shifting trends of market sentiment and market watchers customarily watch for crossings of two averages. The 50 week (1 year) average of the SP500 index just crossed below the 100 week (2 year) average, indicating a broad and sustained lack of confidence. Falling oil prices since mid-2014 have led to severe earnings declines at some of the large oil companies in the SP500. The index is selling for about the same price as the two year average. What to do? These crossings or junctions can mark a period of some good buying opportunities – unless they’re not – and that’s the rub with indicators like this one. Downward crossings typically occur after there has already been a 5 – 15% decline from a recent high. If an investor sells some stocks at that time, they wind up selling at an interim low, and regret their action when the market rises shortly thereafter. They should have bought instead of sold. AAAARGHHH, a false positive! Twice in the 1980s, the sentiment shift was less than a year long and an investor who did act lost 10 – 20% as the market climbed after several months. Conversely, after a 10-15% decline, some investors do buy more stocks, figuring that the excess optimism, or “fluff,” has been shaken out of the market. Then comes that sinking feeling as the market continues to decline, and decline, and decline. In April 2001 and July 2008, the 50 week average crossed below the 100 week average. Investors who lightened up on stocks at those times saved themselves some pain and a lot of money as the broader market continued to lose another 30% or so. There are not one but two problems with timing models: timing both the exit from and entry back into the market. Over several decades the majority of active fund managers – professionals who study markets – did not get it right. They underperformed a broad index like the SP500 because the index is actually a composite of the buying and selling decisions of millions of market participants. John Bogle, the founder of the now gigantic Vanguard Funds, made exactly this point in his dissertation in the 1950s. A half century later, this “wacky idea” of index investing has taken over much of the industry. Consistently successful timing is very difficult and has tax consequences in some accounts. Investors are encouraged to focus instead on their investment allocation to match their tolerance for risk and volatility, and to consider any prospective income that they might need from a portfolio. Since 1960, the average annual price gain of the SP500 index has been 6.7%. Add in an average yield (dividend) of 3% and the total return is almost 10% that an investor gains by doing nothing, a formidable hurdle for any timing model. Within an allocation model, though, is the idea that an investor might shift a small portion of a portfolio from stocks to bonds and back in response to market signals. In several previous articles I have looked at a Case-Shiller CAPE10 model (here, here, here, and here) as well as another crossing model using the 50 day and 200 day moving averages, dramatically named the Golden Cross and Death Cross (here, here, and here.) As already mentioned, we want to avoid some of the false signals of crossing averages. Instead of a crossing, we can simply use a change in direction of both averages. When not just one, but both, long term averages turn down, we would move a portion of money from stocks to bonds, and in the opposite direction when both averages turned up. Over the course of several decades, this strategy has been suprisingly successful. The market sometimes experiences a decade when prices may be volatile but are essentially flat. From 2000 – 2012 the SP500 index went up and down but was the same price at the beginning and end of that 12 year period. 1967 to 1977 was another such period, a stagnant period when an investor’s money would be better put to use in the bond market rather than the stock market. In recent decades, this long term weekly model would have favored stocks from 1982 to March 2001 while the market gained 850%, an annual price gain of 11%. The model would have shifted money back to stocks in August 2003 at a price about 25% less than the exit price in March 2001. In March 2008, the model would have favored an exit from stocks to bonds. The stock market at that time was about the same price that it had been 7 years earlier in March 2001. The model captured a 30% gain while the index went nowhere. In the 1967 – 1977 period, the model did signal several entries and exits that produced a cumulative 8% price loss over the decade but the model favored the bond market for half of that period when bonds were earning 8% per year, a net gain. In almost two years, the SP500 has changed little; the yield is less than 2%, far lower than the 3% average of the past 50 years. However, the broader bond market has also changed little in that time and is paying just a little over 2%. There are simply periods when strategies and alternatives have little effect. Although the 50 week average crossed below the 100 week average earlier this month, they are essentially horizontal. The 100 week average is still rising, but barely so, a time of drift and inertia. In hindsight, we may say it was the calm before a) the storm (1974), or b) the surge (1995). Usually the calm doesn’t last more than two years so we can expect some clear direction by the end of the summer. One of the myths of Presidential politics is that Presidents have a lot to do with the strength or weakness of the economy, a superhero narrative carefully cultivated by the two dominant parties. Here’s a comparison of GDP growth during Democratic and Republican administrations. The Dems have it up on the Reps since 1928, chiefly because the comparison starts near the beginning of the Great Depression when the Reps held the Presidency. For several reasons, GDP data is unreliable during the Depression and WW2 years. First, the GDP concept wasn’t formalized till just before the start of WW2 so data collection was new, primitive and after the fact. Secondly, this 14 year period includes an extraordinary amount of government spending which warped the very concept of GDP. The WPA program that put so many to work during the depression years was a whopping 7% of GDP (Source), like spending $2 trillion dollars, or half the Federal budget, in today’s economy. The Federal Reserve begins their GDP data series after WW2 when data collection was much improved. If you’re a Dem voter, don’t mention this unreliable data. Just tell friends, family and co-workers that the Dems have averaged 4% GDP growth since 1927; the Reps only 1.7%. If you’re a Republican voter, exclude the 20 year period from 1928 to 1947 and begin when the Federal Reserve trusts the data. Starting from 1947, Republicans have presided over economies with 2.75% annual growth during 36 Presidential years. During the 30 years Dems have held the Presidency, there has been a slighly greater growth rate of 3.1%. In short, economic growth is about the same no matter which party holds the Presidency. Shhhh! Don’t tell anyone till after the election is over. Legislation by the House and Senate has a much greater impact on the economy. These foreboding quotes are from a recent Gallup poll. Small businesses employ more than 50% of employees and are responsible for the majority of job growth yet many politicians and most voters pay little attention to the concerns of small business owners. The giant corporations get most of the press, praise and anger. Could the lack of small business growth be responsible for the lackadaisical growth of the entire economy during this recovery? As the population continues to age, growth will be critical to fund the dedication of community resources to both the old and young. The BLS routinely tracks the Employment-Population Ratio, which is the percentage of people over 16 who are working, currently 60%. But this ratio does not fully capture the total tax pressures on working people since it excludes those under 16, who require a great deal of community resources. 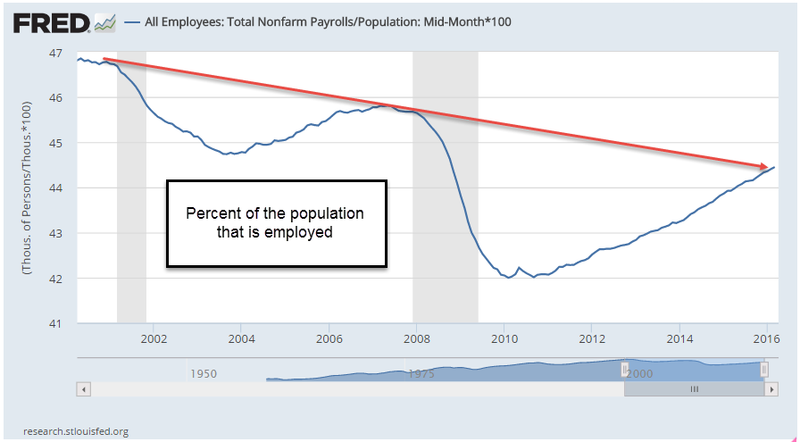 When we track the number of workers as a percent of the total population, we see a long term decline. As this ratio declines, the per-worker burdens rise for it is their taxes that must support programs for those who are not working, the young and the old. Regulatory burdens hamper many small businesses. A recent incident with a Denver brewery highlights the sometimes arbitrary rulemaking that business owners encounter. Agencies protest that their mission is to ensure public safety. An unelected manager or small committee in a department of a state or local agency may be the one who decides what is the public safety. As the rules become more onerous and capricious, fewer people want to chance their savings, their livelihood to start a small business. As fewer businesses start up, tax revenues decline and the debate grows ever hotter: “more taxes from those with money” vs “less generous social programs.” Policy changes happen at a glacial pace, further exacerbating the problems until there is some crisis and then the changes are instituted in a haphazard fashion. Since we are unlikely to change this familiar pattern, the issues, anger and contentiousness of this election season are likely to increase in the next decade. Keep your seat belts buckled.